The beginning of November marks the return of the Sell-In-May-And-Go-Away crowd. They’re returning to a market that’s on much more solid footing than it was a few months ago. US stocks enjoyed an impressive rally over the last month. The S&P 500 shot up 12.5% from the low on September 29th to the close on November 2nd. That’s an impressive gain to say the least. Along the way, the S&P 500 cut through multiple resistance levels like a hot knife through butter. 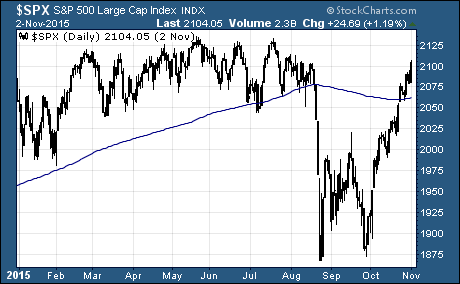 Now the large cap index is back above all critical moving averages like the 50-day moving average, 200-day moving average, and the 50-week moving average. 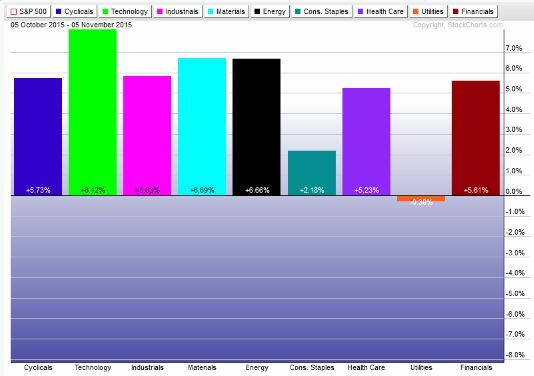 All sectors, except utilities, have raced higher over the last month. The impressive move was fueled by a combination of better than expected third quarter earnings and central bank actions that are beneficial to stocks. There was a large influx of money that flooded out of short term treasuries after the latest Fed announcement. In short, the Fed put the possibility of a December rate hike back on the table… if the economic data supports it. A big chunk of this money found its way into junk bonds. 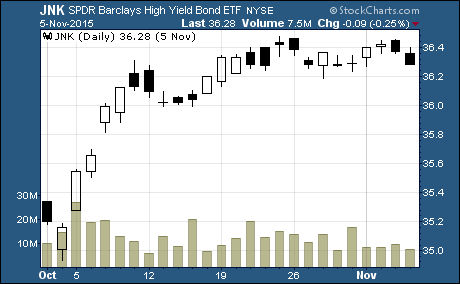 Look at the surge in volume and strong price performance of SPDR Barclays High Yield Bond ETF $JNK. However, there are still headwinds for stocks. The US Dollar is strengthening again. That puts pressure on commodity prices and corporate earnings made in foreign currencies. And slowing economic growth in China is hurting as well. Companies that made a big push into China in recent years aren’t seeing the growth they expected for everything from basic materials to consumer items. Those concerns aside, there’s no doubt that the recent rally has flipped investor sentiment. According to the AAII Investor Sentiment Survey, 40.4% of investors are now bullish on stocks over the next six months. That’s an increase of 5.6% from last week. Amazingly, the S&P 500 is back near the all-time high. Needless to say, the rally has shot holes in the theories that stocks were entering into a bear market. But don’t forget that the correction did break the uptrend. And there are still lots of uncertainty about the next market move. We could be at the beginning of new uptrend. Or we could enter another period of stagnant stock returns and range bound trading. Or the recent rally could be a counter-trend rally at the beginning of a down trend. All three are very real possibilities right now. Only time and price action will tell us what the next phase holds for stocks.